Milano’s Pizza Millington is some of my favorite pizza in the greater Memphis area. There are other places that have great pizza, but this is one of my favorites in town. There are several branches around Memphis, but my favorite spot is the Millington location. It’s not unusual for us to hike to Millington to run errands so we can stop at the Milano’s for lunch or dinner. The pizza is made with whole milk mozzarella, so even the slice of cheese has the weight of a small piece of lasagna. Milano’s makes excellent calzone’s and their meat stuffed pizza is the crown jewel of their creations. It’s knife and fork pizza. Local’s choice: Meat stuffed with red sauce on top, maybe a slice of cheese if I’m really hungry. Tiramisu is also the best kept secret in the restaurant. Also, if you’re feeding a soccer team, office or the 3rd Marine Division they sell wagon wheel pizza’s for large crowds. 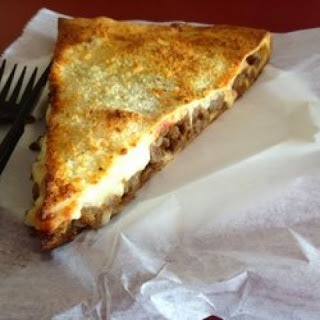 This entry was posted in Charlie Sierra, Italian, Millington, Pizza by Trevor Knight. Bookmark the permalink.